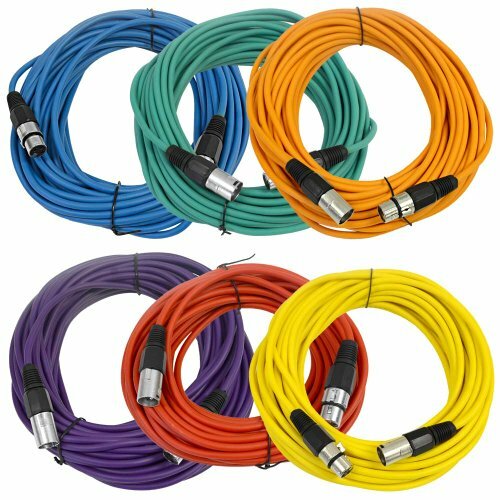 (6 Pack) Multiple Colors 50" XLR Patch or Microphone Cable - Model Number: SAXLX-50 (Pack of 6), Multiple Colors: Blue, Green, Orange, Red, Yellow, Purple, Metal 3 Pin XLR on each end (Male & Female), Heavy Duty Flexible Rubber Jacket, Length: 50 Feet for each cable, Shielded Cables, These cables are brand new, One year warranty. Balanced. XLR (microphone) cables are ideal for connecting mixers, equalizers, crossovers, amplifiers anything that requires a balanced 3 pin XLR connection. They can also be used as microphone cables or for connecting DMX lighting fixtures. 22g Oxygen-Free Copper (OFC) conductors for enhanced signal clarity and superior RF rejection.